The fascinating story of an orphan boy who hungered more for love and affection than for food. Learn how Tony's loyalty and selflessness helped him to earn respect and favor, and to become a part of the family he longed for. This is another in a delightful series that I have found. The publishers of the stories are reaching back through the decades to find wholesome stories that have never been available in audio before. These are appropriate for the whole family and it would be great to listen to one or two chapters in the evening after dinner or at bedtime, in my opinion. Alone in London is a historical story about a street boy named Tony who happens upon Oliver, an elderly man and his granddaughter Dolly. The 3 of them make their own little family in life in the slums of London. My only gripe with these old stories (and it is not a negative) is the depths of tragedy found within. There is a religious aspect that is revealed to comfort, but for me, I find that listening to one of the stories, once in a while is enough. If I were to listen to them back to back to back, I think I would become depressed. 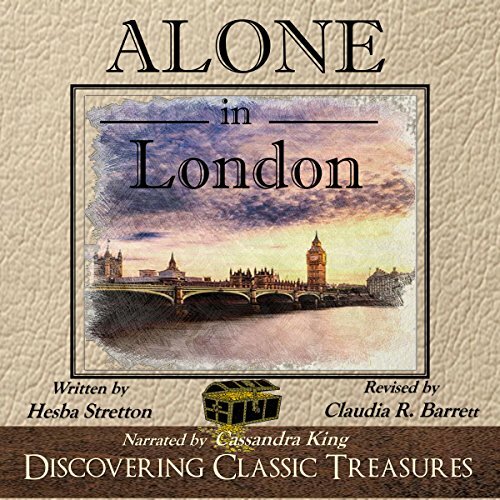 Cassandra King is a wonderful narrator. She is able to portray Oliver, Tony (around 10 years old) and Dolly (who is even younger) with ease. Overall, this is a great story for the individual or for the family. It is free of vulgarity in any shape or form. There is a religious component, as well. I loved this book. I couldn't stop listening. The narrator's voice made me feel all of the emotions and had me crying. I got this ARC via audiobook boom and this is my voluntary review. This book made me smile, laugh, cry, feel sorry and cheer. I loved this story. The story that revolved around a little girl, an orphan boy and a grandfather who cobble together a family. The secondary characters helped to make the story. The narrator was very good and made the story come to life. I was happy to listen to this story. I very much enjoyed the plot of this book. It kept my attention and I was entertained. I haven’t read too many books written about or from the perspective of teachers and I enjoyed it. I am hoping for future books with these characters. The narrator did a great job of performing so it was a pleasant experience all around. Loved this book and narration. I couldn't stop listening! I was given this free review copy audiobook at my request and have voluntarily left this review.